New York has done it again: missed another fracking deadline. And this time the Joint Landowners Coalition of NY (JLCNY) is putting its feet down; they're going to sue the state for not allowing fracking. Why?Because, says JLCNY attorney Scott Kurkoski, "We've been denied all economic benefit to our property." At issue is the delay of promulgating fracking regulations because, well, the Commissioner of Health is still working on a health study to determine whether - and how - highly industrialized unconventional drilling requiring high-volume horizontal hydraulic fracturing affects the public health. And the governor is waiting for him to complete the study before he decides whether or not to permit fracking. This doesn't faze the JLCNY because.... well, because apparently economic gain trumps health. The idea that the state might want to ensure that public health is not endangered is, to the JLCNY, a "takings". The fact that gas may not even be worth extracting doesn't seem to enter this equation. Ensuring the health of the public now and for future generations apparently doesn't enter the equation either. Because, says JLCNY president Dan Fitzimmons, the "futures of our children, our communities and everything..." will be taken away if gas drilling isn't allowed. Ironically, gas drilling IS allowed in NY. 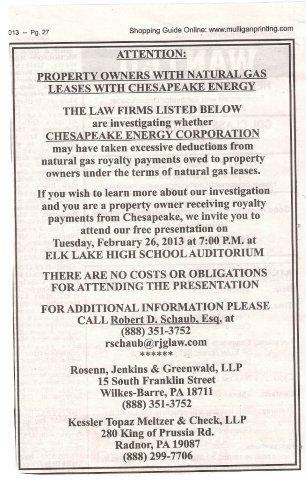 It's just one kind of gas drilling that isn't - and, by god, that's the kind JLCNY wants or it will sue. All they're lacking are the plaintiffs. Meanwhile, other landowners who would prefer to breathe clean air, drink pure water, provide healthy pasture and forage for livestock, and grow nutritious food, wonder if drilling on their neighbor's land might not deny them "all economic benefit" to their property. 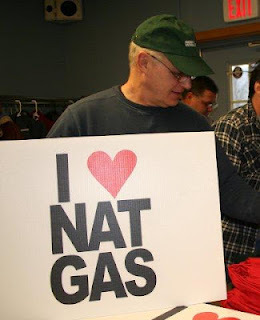 On Tuesday, February 19 the Fort Collins (Colorado) City Council voted 5 - 2 to give initial approval to an ordinance that would prohibit all oil and gas exploration activity within city limits. The final vote will take place March 5. But in the intervening days, they've got a lot to discuss. For instance: who really signed the petition that supposedly came from business owners in favor of fracking within town limits? Because Cali Rastrelli, who used to work at Big Bill Pizza, has no idea how his name got on the petition headed "Vote NO on the Fort Collins Frack Ban". He sure didn't put it there - and the pizza joint, located an hour and a half south of Fort Collins, has no stake in the matter. And to top it off, whoever signed his name spelled it wrong. Rastrelli's not the only one; 22 of the 55 business owners who supposedly signed onto the Colorado Oil and Gas Association (COGA) -sponsored pro-fracking petition told the local press that they were mistakenly included. Either someone signed their name, or they didn't know what the petition was for. And, in some cases, the business owners were against drilling and fracking within the city - boy, weren't they surprised to see their names on the list. In his State of the Union address, President Obama said a lot of things - some outright contradictory, including: we need to take steps to address climate change, followed later by exhorting us to exploit US oil and gas. We can't have it both ways. Yes, yes, burning gas creates fewer climate impacts than burning coal or oil. We've heard it over and over and over and over.... and it's not correct. Because getting that gas out of the ground, shattering it out of the rock, extracting if from tarry sands - those things put more emissions into the air. And all those leaky pipelines and compressor stations - they're emitting methane which is a potent greenhouse gas. Flaring alone produces 400 million tons of greenhouse gases. It's not just affecting our climate, it's harming our health. I fear very much that our children, grandchildren and great-grandchildren are going to look back on this period in history and ask a very simple question: Where were they? Why didn’t the United States of America, the most powerful nation on earth, lead the international community in cutting greenhouse gas emissions and preventing the devastating damage that the scientific community was sure would come? Tomorrow thousands of citizens will march from the Washington Monument to the White House in a huge climate rally. They're sincerely hoping that the president, who promised climate action earlier this week, is listening. NY Fracking Decision Delayed - But Permits Might be Issued Anyway? New York landowners hoping to cash in on gas leases will have to wait a few more weeks for the final decision on whether to allow high volume horizontal hydraulic fracturing. That’s because a key health impact study won’t be completed by this week’s deadline. Today NY Dept. of Health Commissioner Dr. Nirav Shah, sent a letter to Dept. of Environmental Conservation Commissioner Joe Martens saying: we need more time to finish the health review. The Department of Health review asks whether the final draft SGEIS (Supplemental Generic Environmental Impact Statement) adequately identifies potential public health impacts of high-volume horizontal hydro-fracking. It also considers whether DEC needs to add mitigation measures beyond those already proposed in the SGEIS. A University of Pennsylvania study in collaboration with scientists from Columbia, Johns Hopkins and the University of North Carolina. With the health review incomplete, the DEC will not be able to issue the thousand-page-plus environmental impact statement tomorrow – a requirement to meet a Feb. 27 deadline for its regulations. Missing that deadline could mean that DEC would have to reintroduce the fracking rules, a process that would re-open then to public comment. But maybe not, says DEC Commissioner Martens. In response, Martens reiterated that he would not issue a final SGEIS until the health review is complete. He admitted that, indeed, the proposed high-volume hydraulic fracturing regulations cannot be finalized until the SGEIS is complete. But, says Martens, “this does not mean that the issuance of permits for high-volume hydraulic fracturing would be delayed.” IF the Health Review determines that the SGEIS adequately addresses health concerns, and IF Martens adopts the SGEIS on that basis, then “DEC can accept and process high-volume hydraulic fracturing permit applications 10 days after issuance of the SGEIS.” If, on the other hand, the health review determines that there are health concerns that still need to be addressed, DEC won’t issue permits. A couple years ago I had the pleasure of meeting Carol French, a dairy farmer in Bradford County, PA. She came to the town of Caroline, NY to share some of her experiences of living and farming in a drilling area. Since then I have heard her speak a couple more times. Since 2011 she’s seen health impacts to her cows and her family from water contaminated by nearby drilling activity. 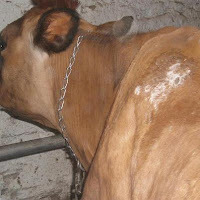 The photo is of rashes her cows have been suffering. That is only one of the health impacts she's seeing on her farm. If I hear one more New York farmer or any Farmer tell me that they want Natural Gas drilling in their state or they signed a gas lease to “SAVE their FAMILY FARM” I will probably lose it! Today I thought it’s going to be a good day. We didn’t lose power (from the big snowstorm). We made our way to the barn to only find that another cow aborts her calf. She was eight months into her pregnancy. Before I was done milking my cows, cow number three starts to abort her calf. She too is eight months into her pregnancy. In nine days we have had three cows lose their calves. For people not familiar with farming I will explain the dilemma. A cow should be “dry” for two months before giving birth. A cow that aborts during this time of her pregnancy doesn’t “come into” her milk real well. This Farmer counts on the replacement calves to continue farming the same number of cows. I have heard from other farmers with “changed” water having similar problems. If this is true, the money from the lease, royalties, and signing other agreements will NOT offset the cost of: 1. Losing your health. 2. Losing your family business, 3. Losing the value of your property. With this stripped from you, what will you have? A farmer claiming that this natural gas extraction is going to save the farm is sadly mistaken. Should that farmer count on this money and lose everything that I had mentioned … he definitely will lose his farm to the gas industry without a dime in his pocket! Carol appreciates our concern – but what she really wants is us, her neighbors in NY, to stand up with her. She has written to her state agencies, DEP, state Dept. of Agriculture, and a host of other people, to no avail. In the next few days the Governor of NY and state environmental regulators will likely determine whether and how to allow high volume horizontal hydraulic fracturing. This is the time, Carol says, for New Yorkers to stand up and speak. Help Pennsylvania fight against Hydro- Fracturing and what it has done to its people living in Pennsylvania. Please remember, what my neighbor agrees to do on his property will affect me, just like what Pennsylvania will do in its state will affect New York, West Virginia, and Ohio. All of these states have become Pennsylvania’s drilling waste dumping grounds for the gas industry. Since last year, organic farmers, outdoors enthusiasts, and local businesses dependent on tourism have been trying to get the federal Bureau of Land Management to reconsider thousands of acres proposed for oil and gas leases in the North Fork Valley of Western Colorado. Yesterday the BLM removed 20,000 acres in Delta County from the Feb. 14 lease auction. The decision follows months of sometimes raucous public meetings and more than 100 protest letters from organic farmers, vineyard owners and tourism businesses. Their argument: oil and gas drilling would jeopardize the vibrant and growing economy, and fail to protect the environment. The BLM oversees oil, gas and mineral leasing on all federal lands. Under 90-year-old laws, companies and people can nominate public lands for drilling. BLM reviews the proposals, checking for other land uses including wildlife habitat and wilderness uses. Then, if there is no overriding conflict, the government is obliged to auction them - after some months of review and public comment. What drew the ire of organic farmers and others in Delta County was the secrecy surrounding the nominations. Who chose those particular parcels, they wanted to know. A local activist group, Citizens for a Healthy Community, has a lawsuit pending under the federal Freedom of Information Act to find out the name of the nominator. Residents also objected that the lease sale was being conducted using a 1989 resource management plan – a plan that ignores the dynamic growth of organic agriculture and other economic changes.